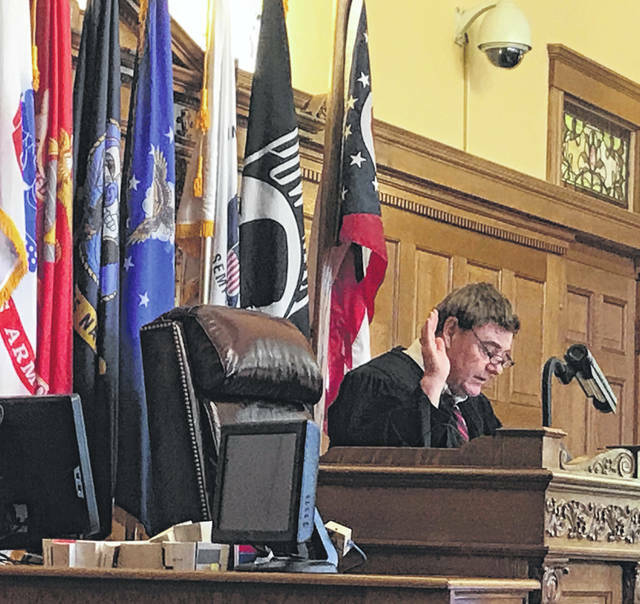 Judge Michael A. Buckwalter swears in potential jurors. Anna Bolton | Greene County News Defense attorney Gregory Meyers, closest, introduces himself to a group of potential jurors Sept. 4 in Courtroom 1. Logistics coordinator Dennis McManes, Bailiff Christopher Connors, Detective Kelly Edwards, Assistant Prosecutors Cheri Stout and David Hayes, Defense Attorney Kirk McVay and defendant Dustin Merrick look on. XENIA — Potential jurors sat in courtroom rows face-to-face with attorneys, Judge Michael Buckwalter, and defendant Dustin Merrick Sept. 4. Two groups went through identical processes Tuesday, the day jury selection began in the capital trial for a man accused of murdering two. Two more groups will go through the same sequence of events Wednesday. Then next week, some will return to the courthouse for the second week of jury selection. But jury selection — the preliminary phase before the trial — precedes any testimony or evidence, arguments or rebuttals. At the end of the anticipated-two-week process, if all goes as planned, attorneys will have selected a jury of 12 plus four alternates. Only then will both sides be ready for opening arguments. Assistant prosecutors David Hayes and Cheri Stout are representing the state. Defense attorneys Kirk McVay and Gregory Meyers are counsel for Merrick. 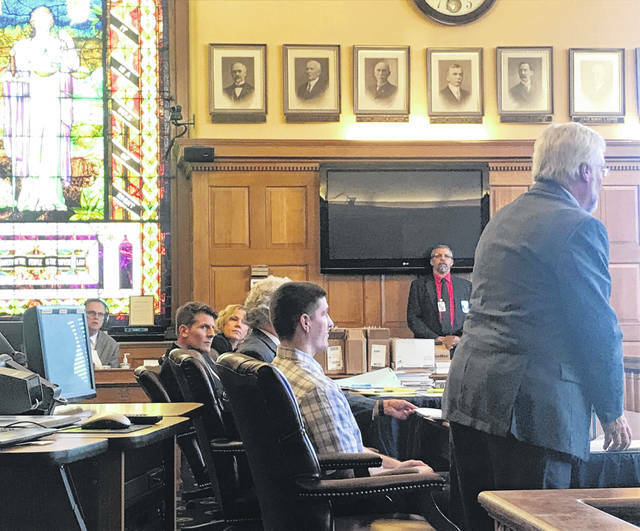 During the afternoon session Sept. 4, potential jurors stood and raised their right hands, under the direction of Buckwalter, and swore under oath to respond truthfully to all questions. “Dustin Merrick is presumed innocent unless the state proves him guilty beyond a reasonable doubt,” Buckwalter said to the group. Potential jurors then filled out a questionnaire, and some met individually with the judge and attorneys to discuss any concerns regarding serving. Some were excused. Once the jury is selected, the trial is anticipated to last three weeks. Buckwalter explained the trial may have two phases: a trial phase and a sentencing phase. During the first, the jurors will deliberate and will be asked to return a verdict. If they return a guilty verdict, they will deliberate again and recommend a sentencing verdict. “This case may involve your consideration of the death penalty. You may, not shall, but it is possible that you may be asked to consider rendering a verdict sentencing the defendant, Dustin Merrick, to death,” he explained. If the jurors find the defendant guilty, they would have the responsibility of choosing a sentencing verdict: possibly life imprisonment without parole for 25 or 30 years, life imprisonment without parole, or death. During both deliberations, Buckwalter said, the jurors will be sequestered in a hotel, without access to electronics. Potential jurors that aren’t excused this week will return next week for small group voir dire, leading up to general large-group voir dire. Merrick and his brother Bret, who will be tried in October, are accused of allegedly shooting and killing William “Skip” Brown, 44, inside his Yellow Springs home and Sherri Mendenhall, 63, outside the home in January of 2017.
https://www.fairborndailyherald.com/wp-content/uploads/sites/50/2018/09/web1_Buckwalter.jpgJudge Michael A. Buckwalter swears in potential jurors. https://www.fairborndailyherald.com/wp-content/uploads/sites/50/2018/09/web1_DefenseStands.jpgAnna Bolton | Greene County News Defense attorney Gregory Meyers, closest, introduces himself to a group of potential jurors Sept. 4 in Courtroom 1. Logistics coordinator Dennis McManes, Bailiff Christopher Connors, Detective Kelly Edwards, Assistant Prosecutors Cheri Stout and David Hayes, Defense Attorney Kirk McVay and defendant Dustin Merrick look on.